Papercrafts by Patti: Happy Day--I Got to Play! Happy Day--I Got to Play! I. am. smitten! This 3/8" Ruffle Stretch Trim is so soft and silky and easy to work with. See all of those "waves" of trim above? Each color is only a portion of the entire spool!! The colors I have are Coastal Cabana, Crisp Cantaloupe and Strawberry Slush. I WILL be ordering the other two colors: Baked Brown Sugar and Pistachio Pudding! I LOVE this trim. For my first project with the Ruffle Stretch Trim, I decided to be conservative and just place one row of the Coastal Cabana color onto my card. BUT, I can just see me placing rows and rows in lots of colors on lots of cards in the future! I won't be able to help myself! Above the trim is a "bow" that I snipped and made out of the new Modern Medley Designer Series Paper. This tiny print is perfect for my 1/2" wide bow. To dress up the bow further, I added a tiny piece of 1/8" Basic Black taffeta ribbon and a teeny button from the new Brights Designer buttons. Under the trim, I stamped an image from the new Happy Day stamp set in White Craft ink, which I then embossed with White embossing powder. I added three pearls, mostly to cover up my messy embossing! I didn't want to start over and I added the image after the rest of the card was finished. I wanted to get this card up as soon as possible. I still have a lot of organizing to do before I can play with the rest of my new items from the Annual Catalog, but I will be trying my hardest to get that done ASAP! Enjoy, and don't forget to leave me your comments below. If there is any special item you are enjoying best from the new catalog, won't you tell me what it is? Order YOUR Stampin' Up! 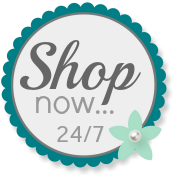 supplies from my Online Store any time. Patti love your card and I LOVE how you displayed the ribbon. It really shows the ruffles and the colors so nicely. I wasn't even aware it was stretchy. Thanks for the info. hugs.